If there’s anything I really dislike, it’s when people who don’t spend a lot of time around animals- especially very large ones- dictate to me or anyone else what to expect around animals they know very little about. I got this warning not long before I took for Tanzania the first time to climb Kilimanjaro. 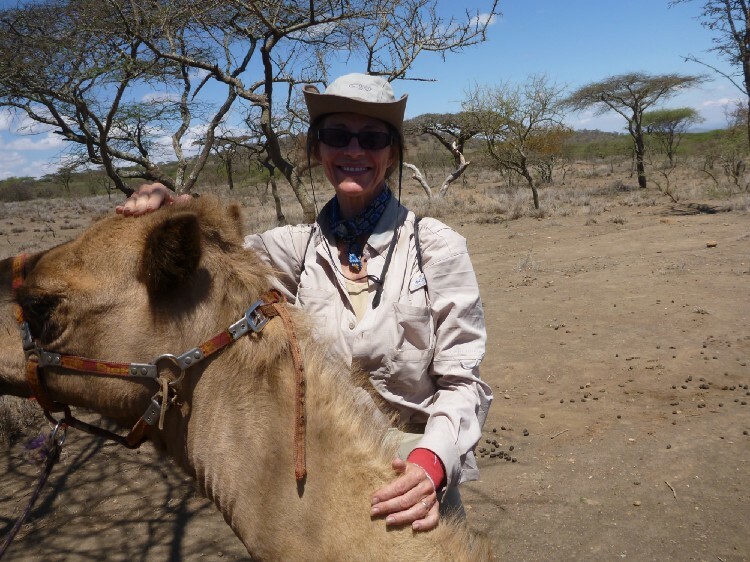 E-Trip Africa, at my request, had put together an itinerary which included riding a camel for three days between Arusha and Moshe, which is a small town at the base of Kili. 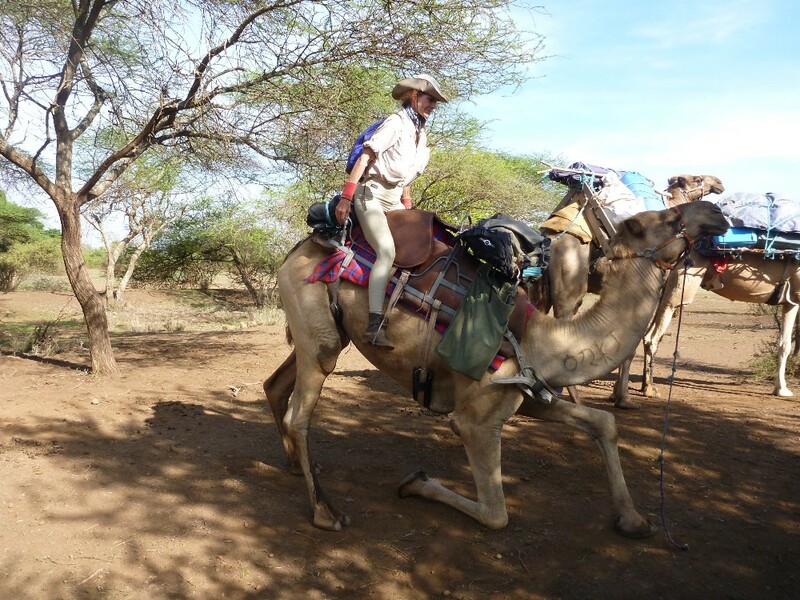 This camel outfit, run variously by Masai or Meru managers (depending on whether the Masai manager has walked off the job as had happened just before I showed up), offers rides from a few hours to seven days. Right up my alley. As an experienced horse person, and someone who loves really big animals, I couldn’t wait. However when I went on line to talk about it, all kinds of people popped up to prejudice me about bad camel behavior. The Mkuru Camp had been established by an NGO to provide this particular Masai community with an income. There had been fits and starts, camels had died, but the venture largely succeeded. 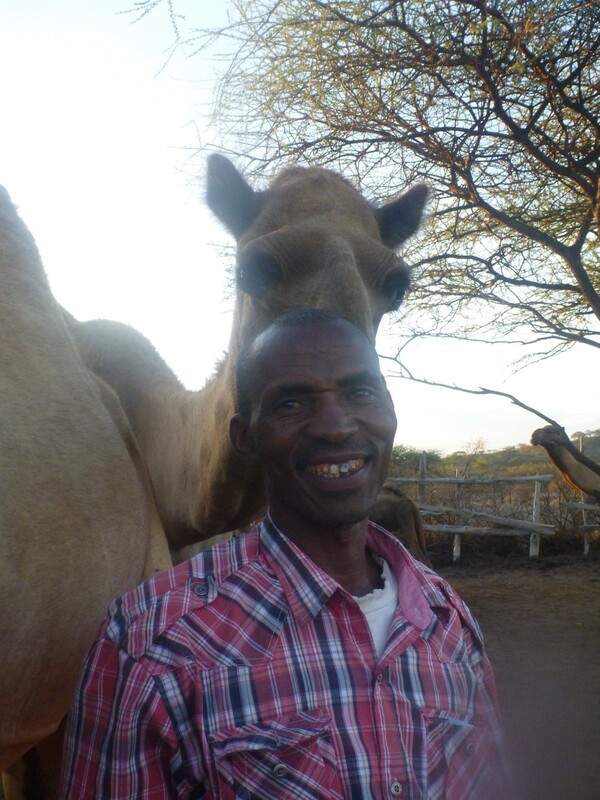 The Masai are not known for their gentility with their animals, as I was to find out. But many of them warmed to the idea of this venture. When I showed up in early November 2013, the Camp had just brought on a Meru man whose previous experience had been as an air traffic controller. Not exactly someone who knew a lot about animals, or specifically about camels. When Ben Jennings, the Managing Director of E-Trip Africa, left me off at the Mkuru Camp, I was shown to my small cabin. Water for the shower would be heated and put into a big plastic bucket over my head the next morning. The winds at night were a lullaby, and I relished the chance to get a good night’s sleep before heading out. The first thing I did after my makeshift shower was to go to the camel corral. There, about 30 of the huge beasts were contained largely by thorny acacia bushes, which is the traditional fencing used by Masai to keep out predators. There was also wood fencing, which I climbed and sat on to watch. This would give me a chance to observe their behavior and how they interacted. What I learned as I watched these enormous creatures was that they are immensely social and have a lovely sense of humor. There were a number of calves which hid behind their mothers’ legs. These were dromedary, or one-humped camels. As I sat and watched their interactions, periodically a female would wander over and blink her huge, thick-lashed eyes at me. They were immensely curious, and approached quite closely. If I put my hand out, they would pull back. So I learned to sit quietly and let them approach me on their own terms. They were almost catlike in the way they protected their space, especially around the head. Some hours later a man introduced me to Dominique, the camel I would be riding. He was enormous. He stood easily seven plus feet, my hand barely able to touch his chin. I asked his handler about Dom, how he liked to be touched, and what idiosyncrasies he might have. Dom was blind in his right eye (the result of abuse by a previous owner) and he was regal in his bearing. I stroked the upward growing hair on his neck gently, and took in his unique and oddly pleasant smell (okay, his breath was another issue entirely). Following his owner’s advice I never approached him from his blind side, and moved quietly around him. The four Masai who would be accompanying me on this trip to Moshe set to putting the pack loads on the camels, which was a loud affair. 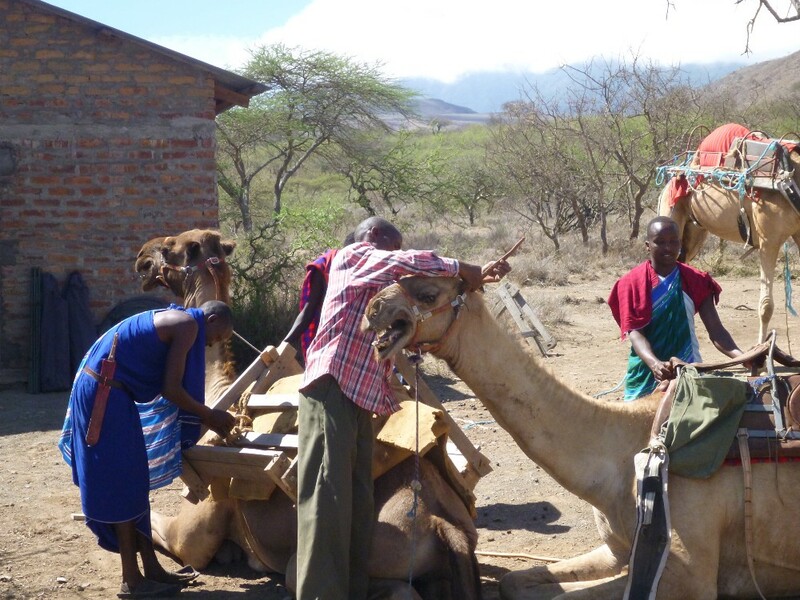 The camels complained and moaned while the packs were strapped on. Dominique had an elongated English- style saddle placed on his back on which I could sit either on top of the hump or on the back as it suited me. Learning to sit a camel is pretty easy. So is learning how to sit as they get up or down- you simply move your body in the opposite direction of where their body is moving to help the animal, and you balance. Riders know this from traveling in the mountains by horse. As we began our journey I watched Dominique’s behavior closely. He would steal bites from certain bushes which had small white flowers. Others had thorns, which his strong teeth and powerful mouth munched to mincemeat. So when we stopped for a lunch break on the first day, I spent most of my time stripping bite-sized pieces off these bushes and delivering them to Dominique. In no time he began watching me carefully when I walked off from where he and the other two camels were tied, and leaned forward in anticipation when I returned with my fists full of treats. By evening of the first day, after I’d spent a lot of my time gathering goodies for Dominique, he make his first overture. He was on the ground settled on the thick pad that is part of their belly and rubbed his head against my shins. I let him, then gently stroked his neck and head. 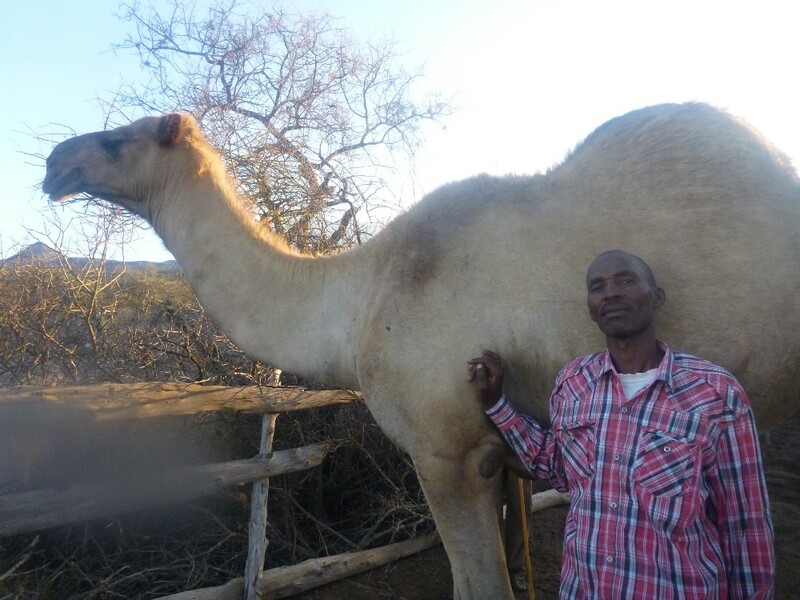 One of the tricks about being around very large creatures like camels is to have no fear of them. Animals read fear as a threat, and respond accordingly. By the same token, camels are a great deal like cats. When they are done allowing you to touch them, they move away. If you follow, or force your affection on them once they have signaled you to stop, that is when you’re likely to get spit on your person, get bitten or kicked. Camels are very particular about their privacy. You earn the right to pet them. They choose when you’re done, not you. The more I fed Dominique, the more he allowed me to pet him. One afternoon after Dom had been chewing on juicy bits of cactus, he eyeballed me quizically for a moment. As I stood close to him, he brought his huge head down to my face. I didn’t move. Gently he bussed my cheek, and I breathed in his breath. I’d been approved of as safe, and friendly. One of the facts of life of traveling by camel with the Masai is that they beat the camel’s legs with sticks to get them to move. As an animal lover this troubled me greatly, and I spoke to the Meru manager about it. The Masai find our love for animals both ridiculous and unfathomable, but the men stopped beating Dominique while I was with them, which I appreciated. I spent lots of time with Dom, stroking his great huge head until he nearly fell asleep, grooming his great powerful neck. One morning as I was delivering bush treats to Dominique, one of other camels bit me on the head. He only got hat, but it was a clear message that he was annoyed about not being included in the treat delivery. Message delivered. I fed all three, and while the other two were far less friendly, they were happy to accept my offerings. 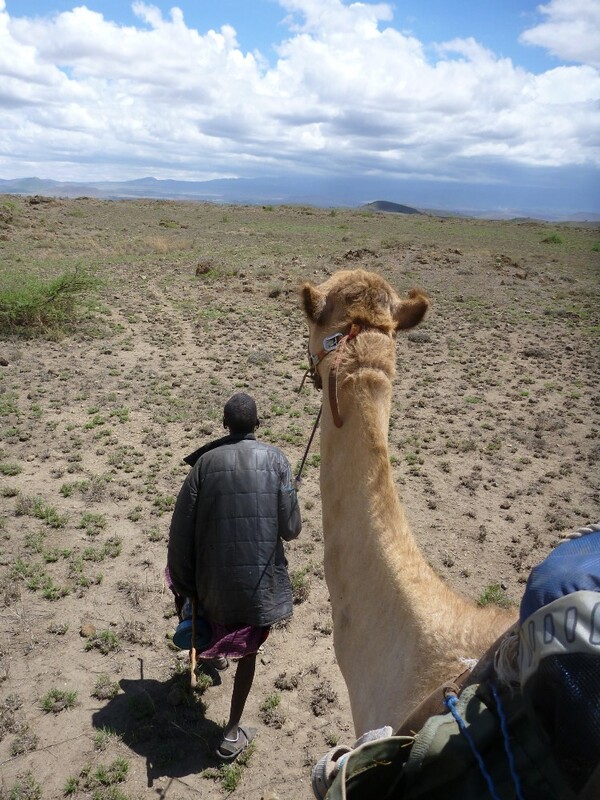 By the time we had made our very slow way across the plains country (which in November was very short of animal life but for the large herds of Masai goats and sheep), Dominique and I had bonded closely. He was my first visit after getting up, and my first concern at every rest stop. He responded with great gentility and sweet affection. As soon as he heard me move inside my tent, he watched for me with his ears pointed forward, knowing that shortly I’d be delivering his favorite snacks. When we reached a small village just outside Moshe, where Ben and his wife Aurelie would be taking me to my hotel to prepare for my climb, we stopped to dismount and wait. Villagers poured out to stare, terrified of the camels each time they moved. I stayed close to Dom, stroking his great head, and kissing him on his nose. I was deeply sad to leave him, but immensely grateful for the time together. 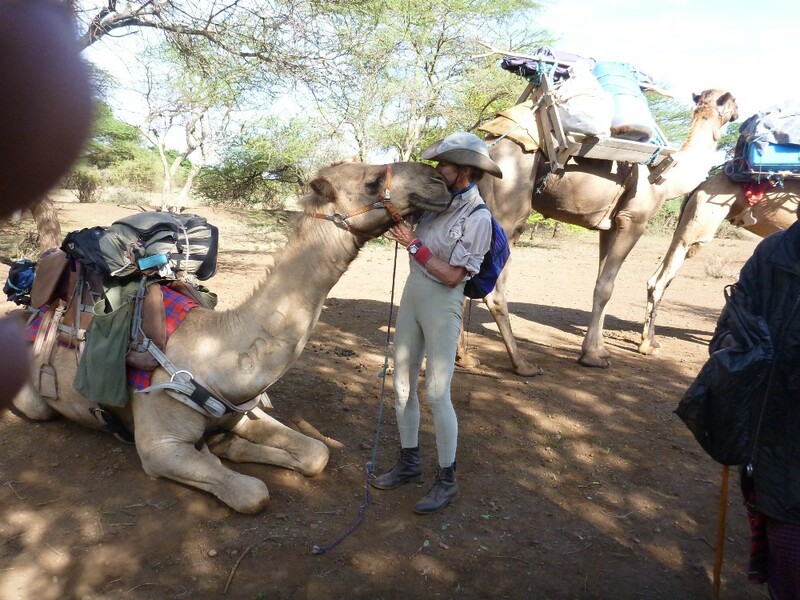 I got in plenty of camel kisses, and left with Ben and Aurelie with tears in my eyes. I have read other reports from people who have ridden camels. They complain about camel spit and being bitten. These animals are immensely strong, and can pick you up and throw you a very good distance if you piss them off. They can easily kill by kicking. Their teeth are something else again. However, as those who work with animals can attest, camels respond to love and kindness just as we all do- when we take the time to study them, seek to move in their world with respect, and appreciate the remarkable creatures they are. I found no reason whatsoever to fear them. 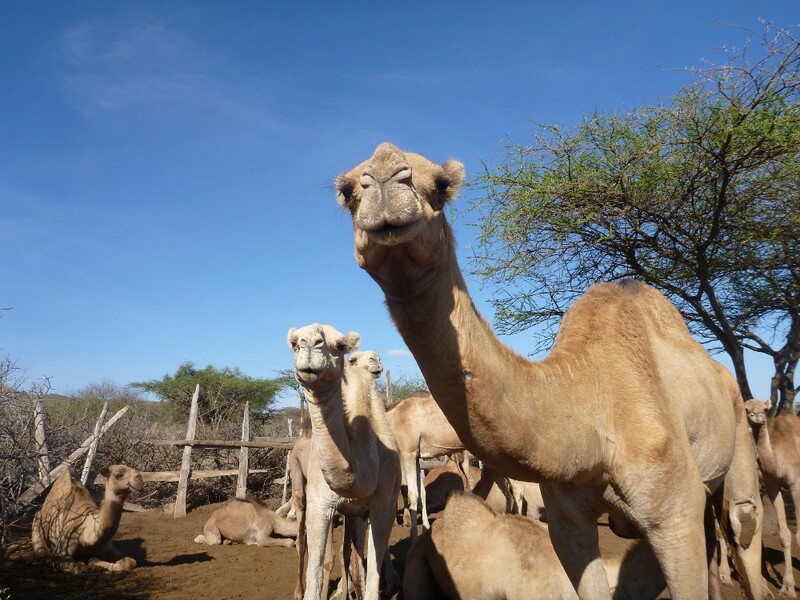 What I did find was that by studying their natures and working within what was comfortable for them, I came away with a great affection for these beasts, as well as considerable eagerness to return to the Mjkuru Camel Safari Camp. I would return to Mkuru in 2015, to ride Dominique again. That’s for another story. For now, don’t let any fool tell you that camels “like” to bite, kick or spit. If they did, you offended them in some way,or approached them with fear. When you are fearless, and intend to be kind, and are willing to be patient enough to earn their trust, you will be deeply rewarded. You might even get a camel kiss. Hold your breath and bring wet wipes. but you’ll be happy you did.